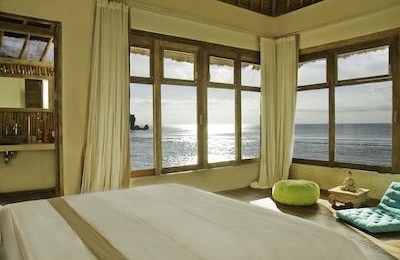 BALI Kitesurf Camp - Sanur, Keramas Guests overall rating: ★★★★★ 5 based on 1 reviews. We offer packages with Kitesurf courses, Kite material rental, Accommodation and Cultural visits. No need to drive. We will take you everywhere. We take our guests shopping to Kuta and on Cultural visits and dinner with Traditional Balinese dance at Ubud. Our Accommodation is far from the noisy Kuta but only 300 metres away from the beach and only 2 km away from Keramas point break. The Kitesurfing is done in Sanur Beach. We also offer packages for families with children, couples or single travellers. We ofer Professional IKO Kitesurf courses. We are opened from May until November..
1st and only KitesSurf Camp in Bali. Our accommodation is a family friendly Surf Lodge with either Single, twin, or double rooms. All Air conditioned rooms with private bathrooms, plenty of privacy, and its only 300 metres away from a beach with waves, and 20 minute walk away from famous Keramas (a worldclass right hander). A typical breakfast is Sausages, bacon, toasts, homemade marmalades, pancakes, Fruit salad, eggs, coffee, cereal, croissants, and orange juice. If we go out for the entire day, Wayan will pack us lunch. Some nights we go to the Safari Park for dinner. Its an spectacular restaurant only 4 km from the resort where you are eating dinner just few metres away from the lions. Harness the power of the wind as you skate across the ocean in the exciting new sport of the kite surfing with three levels of tuition from experienced instructors. Start with the basics in the classroom to understand wind patterns and the handling skill required, including step by step video demonstrations. LEVEL 1 (2 Hours) Designer to familiarize first-timer with equipment and provide an understanding of wind and ocean conditions, followed by a simple multi-question test to check your safety skills. Course includes instruction in equipment preparation, trainer kite flying on the beach and learning how to launch the kite. LEVEL 3 (1.5 Hours) The most advanced of all of the IKO certifications and the final step of the learning process. Once you’ve mastered Levels 1 and 2, learn how to generate speed and move up and down wind. You’ll also learn how to change direction and grab some air with basic jumps and aerial maneuvers. The Yoga is done in a proper Yoga center only 15 minutes from the resort, and offers a range of classes to suit all levels of competency from beginners to teachers – We have classes every day both during theday and in the evening. Our teachers are all qualified and experienced. They are a mix of Indonesian and Western teachers, male and female and vary in styles and philosophies so there is a something for everyone. Our lovely air studio is cooled by overhead fans and has a very inspiring and peaceful view. It is made by natural materials and it is very conductive to a wonderfully rewarding yoga session. Experience the thrill of one of the hottest sports in Asia with a wakeboarding lesson and learn everything you need to get started in one easy session. Then move up to tricks, flips and aerials with one on one tuition in a private lesson or join a group of up to 3 people in our fast, purpose-built wake boat. Learn everything you need to know in a foundation course for novices or join the fast for students with snowboards or water-ski experience. We use boards with and without bindings and for advanced riders, the freeform wake skate. Level 1 This is all about equipment knowledge, hand signals and safety on the board, boat and in the water. Learn how to make a deep-water start, ride in the boat wake and what to do when you fall. Pick up some advanced techniques with one-handed riding and surfing the wake. This course is designed for all and provides a good basic grounding. Level 2 Build on the basic and learn how to perform 180s and ride the wake. As your confidence grows, discover the secrets of body and arm positioning that will set you up for perfect jumps and landings and practice with single wake jumps. Experienced surfers Our purpose-built wakeboard boat is available for private sessions for experienced wakeboarders or students wanting to practice. Our boat drive will take you to the smoothest conditions and setup the boat with the wake height right for you. Use our equipment or bring you own. Just ask our manager or Surfguides and they will organize anything you want: Horse back riding along the beach (stables only 300 metres from our Lodge). Diving, Yoga, Golf, Kitesurf, Stand Up Paddle, Wakeboarding, Paraglading, Bungy Jump, Horse back riding on the beach, Safari Park, Elephant park, Water park, Boat trip to Nusa Lembongan Island, Temple visit, Zoo, Sea food dinner at Jimbaran, visit to Ubud, fruit plantations, visit to volcanoes, and ofcourse partying and shopping in Seminyak or classic Kuta!!! 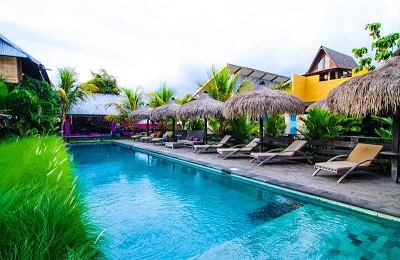 Our Kitesurf Resort is in the East side of Bali, north of Sanur, only 20 minutes from Ubud and surrounded by green vegetation and rice fields. 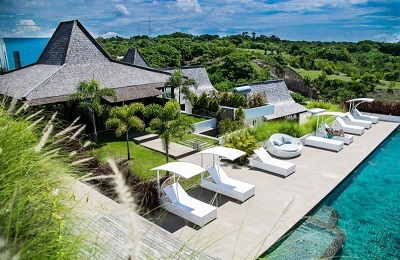 This is a Surf lodge for people searching to experience another kind and more authentic Bali aparts from same old Kuta and Uluwatu…. For people that enjoy tranquilty in and out of the water, walking on the beach, and being close to nature. When you walk out of out of the surf lodge there is no noise, motorcycles, taxis or people trying to sell you things. Its just ricefields and kilometres of lonely dark sand beach. No Malaria in Bali. We will pick you up at Arrivals of the airport. We will hold a paper with your name. Our resort is in SABA beach which is 2 Kms south of Keramas surf spot. If you are already in Bali drive on the Ngurah Rai Bypass towards Sanur. Pass the Macdonals and KFC in Sanur. Keep driving on the highway and follow directions BALI SAFARI PARK 3 kms before Bali Safari Park you will see the sign for NOMAD RESORT on your right. You will need to make a U turn few hundred meters after you see the sign. If you miss the sign or the Uturn just keep driving and do the Uturn atl Safari Park. On the way back turn left on the Nomad Resort sign After 50 metres turn first left at RESORT sign. End of the street turn left again. When searching for flights to Indo, try searching only until Singapore. And from there you search for another lowcost until Bali. This Package can be adjusted for all levels, from 1st timer total beginners to advanced that just need material rental. This is just for people accompanying the kiters but who dont wish to attend any kitesurfing lessons. Daily Transfers to Kuta, Sanur or Ubud etc. "I came here with my bf and 4 friends. We chose here because the guys wanted to have a surf vacation. As a non surfer, I enjoyed my stay here very much. I think those who chose to stay in this resort must had an idea what they could get from here. So we all knew that it is not close to Kuta or any touristic places. It is unfair to criticize in this point. And as the manager replied here, they provided unlimited local transport. Just let them know your plan of the day and they would arrange for you. The guys were very happy with the surf guides. They went to different beaches to surf everyday according to the tide condition. Mrs Wayan was very thoughtful, prepared separated dishes for our friend who took gluten free diet. And ginger tea for me everynight as I had common cold. We shared tables for meal and we could talk to people in a friendly atmosphere. They shared their fun experience in surfing. Their package included one hour free massage, which allowed you to relax with birds sang around, breeze kissing your skin. And they did have wifi here. Lastly, who need a TV here? For those who expect a lot of crazy Kuta type of experience, it is not the place for you. But if you are expecting a relaxing vacation, enjoying the surf experience, and chatting with friendly travelers, it is the place which you would like to stay. And as far as I know, many travelers they came back again and again."